If you don’t have a clear and simple strategic plan you’re either relying on guesswork or using whichever tactics drive the most engagement. Doing this work at the professional level is all about executing a strategic plan. It’s where you know your goals, you know your objectives, you know your strategy, and then you execute the tactics best designed to achieve that strategy. In this post, I want to outline six broad strategic plans which have been successful for clients we’ve worked with in the past (or, in one case, a course student). Consider these ‘off the shelf’ strategies you can use for your community work. Don’t use them wholesale, but adapt them to suit your needs. Advocacy communities are designed to get customers to plead the case of the brand to non-customers. Picture these efforts on a continuum. At one extreme you have cult fans who support you because they love you. Supreme and HarleyDavidson probably fall into this group. At the other extreme, you have reward/incentive-driven communities. Most of Influitive’s clients fall into this group. Between the two, you have word-of-mouth marketing efforts. This is when when people who know you/like you share something you’ve created because it’s remarkable, involves them, or helps the audience look good. Direct selling/referrals to others. If a customer personally invites someone else to become a customer for the brand or make referrals to a sales team to someone who would be a good fit for the product, that’s a big win. Writing customer reviews. This includes writing positive reviews on sites like Amazon, Goodreads, TrustRadius, and any other comparison site. Creating brand-related content. This is when a customer creates positive articles, videos, or podcasts about the product. Gamers do this on Twitch and YouTube all the time. Sharing content on news/content on social. This is where members share discounts, announcements of new releases, or any other brand-content to others. 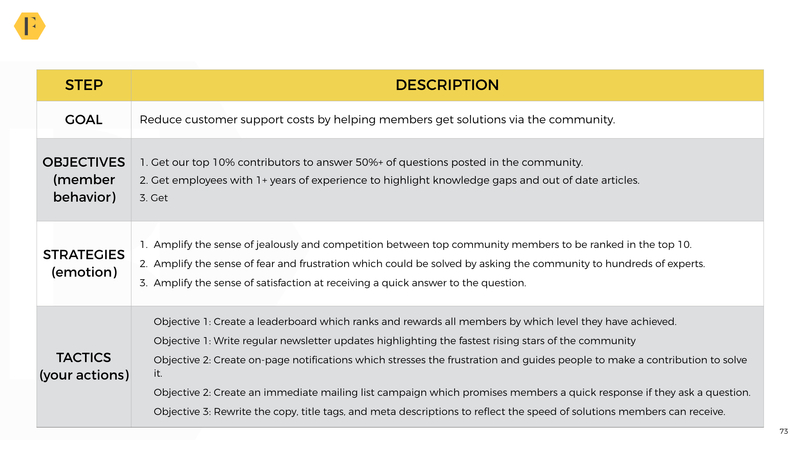 The challenge here is to design community objectives (member behaviors) which achieve two goals. First, they must directly help the community achieve its goal and second, they must match what different member segments are likely to do. All of this should be based upon research. By the end you should have a small list of 5 to 7 tactics which you will commit significant resources to executing. If you get this right, each member segment will be making their best possible contributions to the community. There is only one kind of community where maximizing engagement is a reasonable target and these are communities driven by advertising. Most of the big social networks (Facebook, LinkedIn, Twitter, Pinterest) fall into this category. As do sites like Reddit, StackOverflow, and Nextdoor (plenty of smaller, hobbyist, sites fall into this category too). Getting members to organize members in their own groups. A key principle of exponential engagement growth is fostering sub-groups to increase advertising inventory and member time on platform. This means identifying and nurturing people to run parts of the community. Ensuring members join and participate in these groups. You can’t have successful groups unless you can get members to join and participate in these groups. Keep members actively engaged. You need to persuade people to visit and participate frequently to keep the community going. For each group you want to amplify a unique motivation. This motivation will be very different for top contributors compared with, say, newcomers or lurkers/visitors. As the platform grows larger, you will need far more specific segmentation of the audience. Lead generation (and identification) is one of the most underutilized uses for a community. 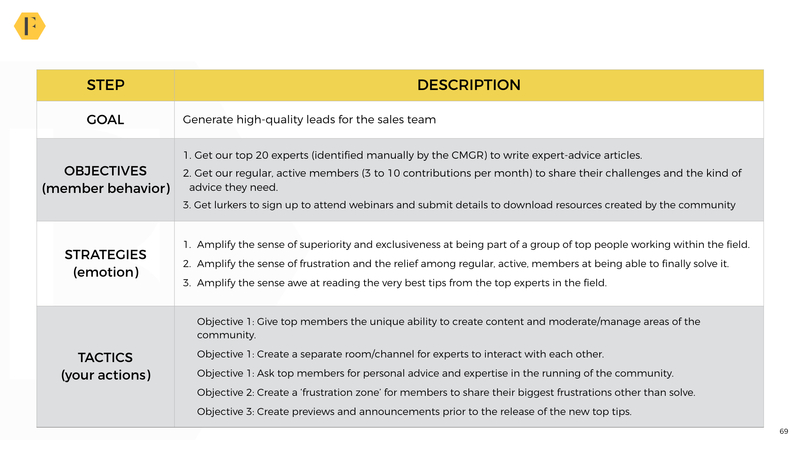 Members provides useful information which could identify them as potential leads for the sales team. Bringing a list of 50+ leads to your next meeting is a good way to build internal support. However, be careful not to invade the privacy of your members or spam them with unwanted offers. Any outreach from a brand representative needs to be done with careful consideration towards the mindset of the member. Downloading content/attending webinars. Members who submit their details to download product/service related content/attend webinars can be considered as strong community leads. Sharing problems the product can solve. If members share a problem which the company can solve, someone can reach out to them and ask if they would like help. Creating content which attracts more search traffic. If members create content which attracts high search traffic, this could generate leads through natural awareness. Pre-purchase behaviors. Using a lead-scoring system, you might identify potential leads through the discussions and posts members click on. Completing surveys. Occasionally, members might reveal themselves as fitting a lead profile through completion of a survey. Developing a strategic plan for a consultancy company tends to be easier than any other goals. Note, below, the type of platform you use to build this kind of community might be different from a support or advocacy community. Sometimes, you might not need much member to member engagement at all. 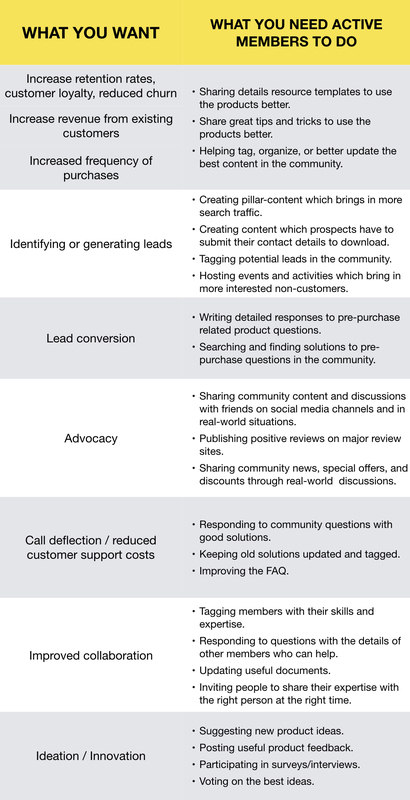 Each of the objectives above should help drive increased search traffic and identify leads within the community. Generating product ideas. This covers all solicited ideas in ideation-driven platforms. Voting on product ideas. This is self-explanatory, members vote on the ideas they like best. Providing feedback on the product/service. This includes every complaint, bug, or frustration members express which can be useful feedback. Participating in surveys/interviews. This is useful solicited qualitative and quantitative feedback. Expressing sentiment. If you track what members say they like or dislike you can gather a lot of useful insights. Engaging in trackable behavior. This includes tracking specific behavior and outcomes e.g. what content or discussions people like best. Ideation/soliciting ideas tends to gain the more attention but is also the least successful. Better feedback usually comes in response to things members can see, touch, and do. 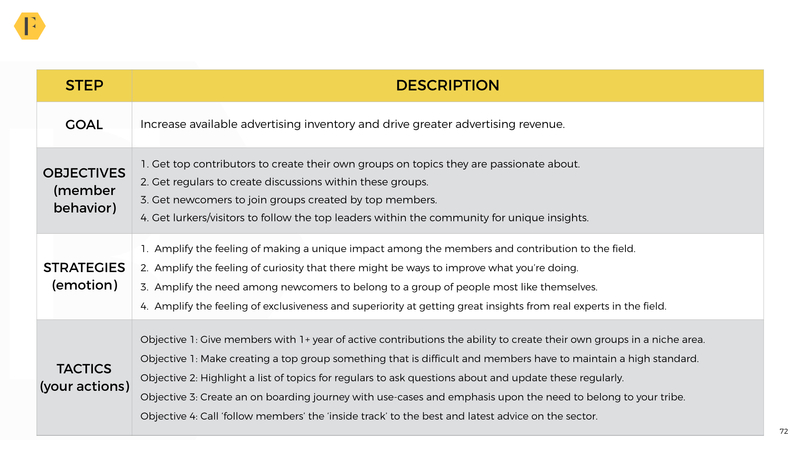 This approach aims to maximize the number of valuable insights generated by the community. We could equally add surveys/interviews at convenient times as an additional objective here. From this, you should be able to use our insights report template and capture the main insights for the engineering team. Support communities are the easiest type of community to create. You launch a platform for people with a lot of questions and divert traffic from your website to this platform. It’s also the easiest community type to connect to direct cost savings. Most organizations with 100k+ customers should consider building a support community. Asking questions in the community (instead of support channels). This is obviously a critical behavior for a support community to succeed. Answering questions in the community (with empathy!). This is equally as important. Questions without solutions are worse than no questions at all. Searching for an answer in the community. The majority of members should be able to find the answer without asking a question. Voting and rating answers in the community. You need help from members to vote and rate answers within the community. This helps the best solutions rise to the top. Strategic plans for support communities are usually fairly transferable from one type of community to the next. The key difference is you usually don’t have regulars. You usually have top contributors, a small group of irregulars, then a large group of lurkers and visitors. There are other ways to achieve these objectives (especially with top contributor programs), but the objectives usually remain relatively the same. Most internal collaboration communities would also fall under this category. Knowledge management (KM) communities (and Communities of Practice) are unique in they often span many of the different archetypes above. 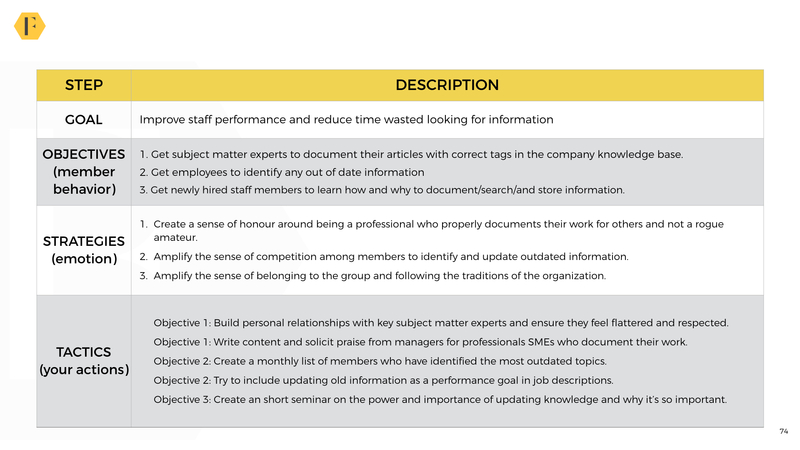 However, the typical KM community emphasizes documenting and keeping knowledge up to date. This saves people time and helps them do better work. Documenting a best practice/lesson learned/templates. This includes actions taken, what worked, where to find useful information, revenue spent, how it was measured etc..This also covers templates for future projects. Keeping and updating previous content. Once content has been shared, it needs to be kept relevant and updated in a systematic way. Tagging and properly storing information. People need to be able to find the information. This means it need to be stored in the right place, with searchable names, and properly tagged. KM communities will have the most flexibility among the strategies you can deploy. Sometimes appeals to honor and pride work well and sometimes appeals to collective rewards work, and sometimes fear of punishment works best. Above we’ve largely used appeals to the better nature of members rather than resorting to punishments. But you can adapt as needed. This isn’t a definitive list of community types. There are plenty of communities based around collective action, crowdsourced fundraising, and plenty other archetypes. This should, however, cover the most common community goals and the kinds of strategic plans you might develop to support them. 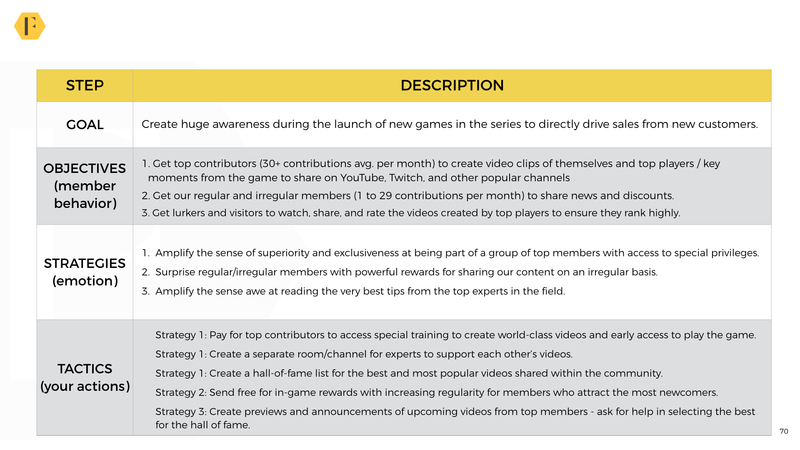 There are multiple different ways to achieve the same community goals through different objectives, strategies, and tactics. The principle is to ensure everything matches up in the most direct and logical way possible. The templates above might help. p.s. We’ve opened registration for our Strategic Community Management course.